You’ll note that I only took a picture of four jars. That is because you are getting three jars of each color to make up the twelve. Now this foil is very delicate and tears easily so you need to go light if you want big pieces. I’ve also found a few pieces of product outside the jars (see one pictured above), which I used when I could. 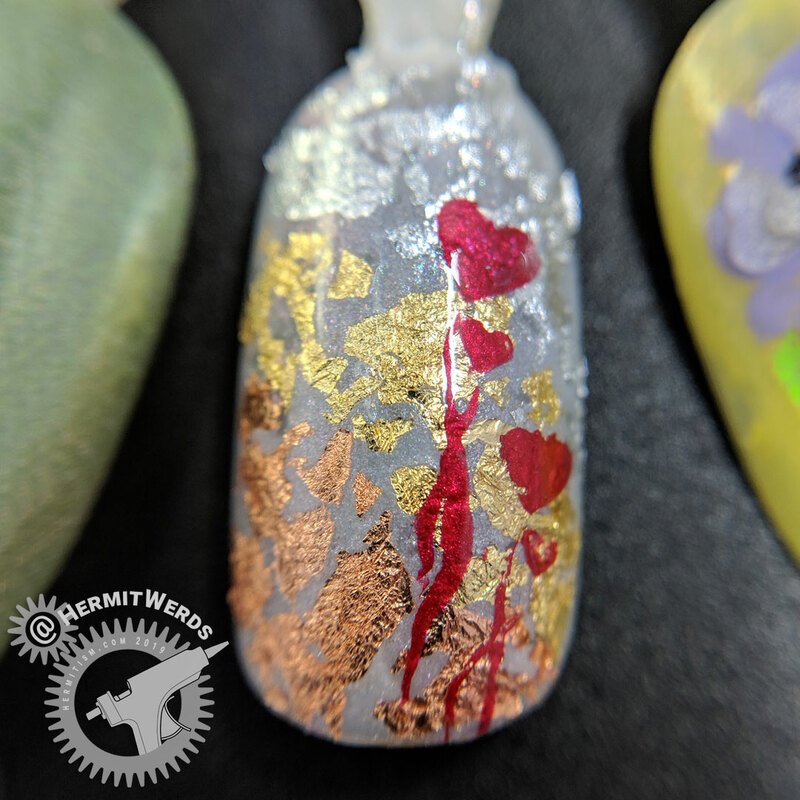 For today’s full design I used nail foil glue to adhere the foil to my nail, but in the sample I simply used the still-wet base polish until it was too dry and then clear polish. Both worked just fine. At first I tried picking up the foil with a clear rhinestone placement tool, but the tool blocked my view too much. I ended up using a toothpick instead with a little water to help it stick. So no special tools are needed to play with these foils. Although I do recommend breaking up the foil into all the pieces you need before starting for faster application. I only used the gold foil in my full design so I wanted to try combining a few different colors in this one. It ended up so glitzy and cool-looking. I may have to revisit this idea again sometime. Gilded Hearts. 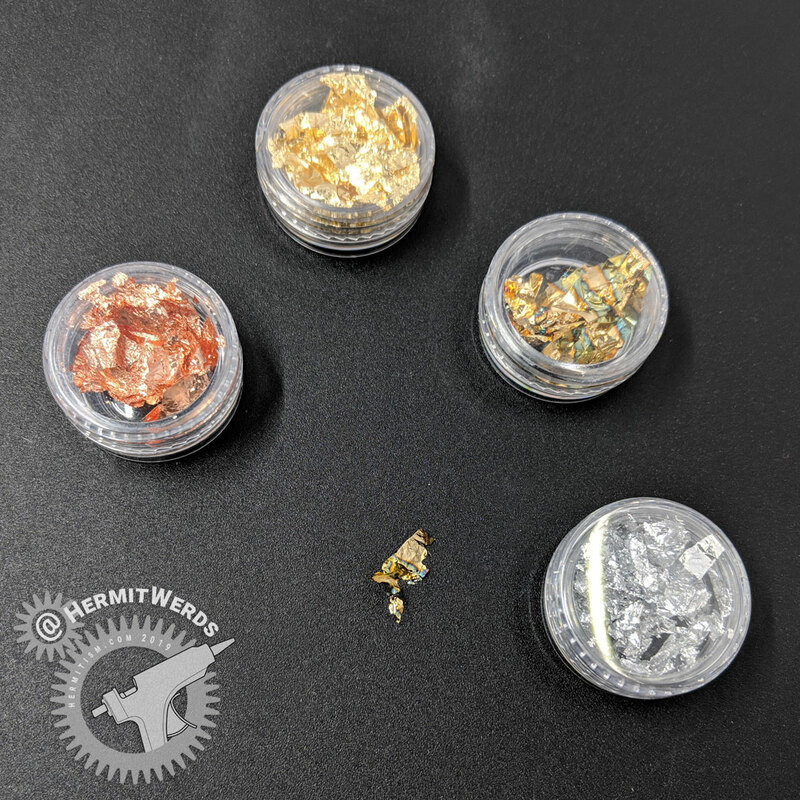 Background is Sinful Colors’ “Social Ladder” with gilding foil from Beauty BigBang’s J2476 (gilding foil) (press sample). Stamping done with B. Loves Plates’ “B. a Cherry Lollipop” using XY-T30. 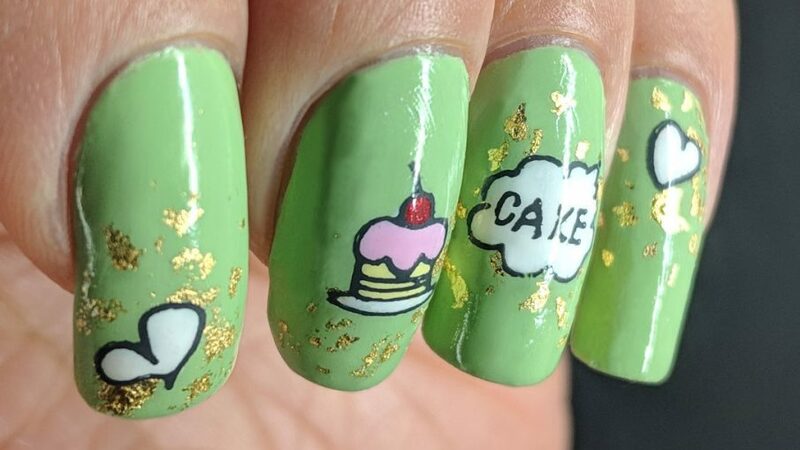 #Glamnailschallengefeb also had a Cake prompt and I am all about the cake. 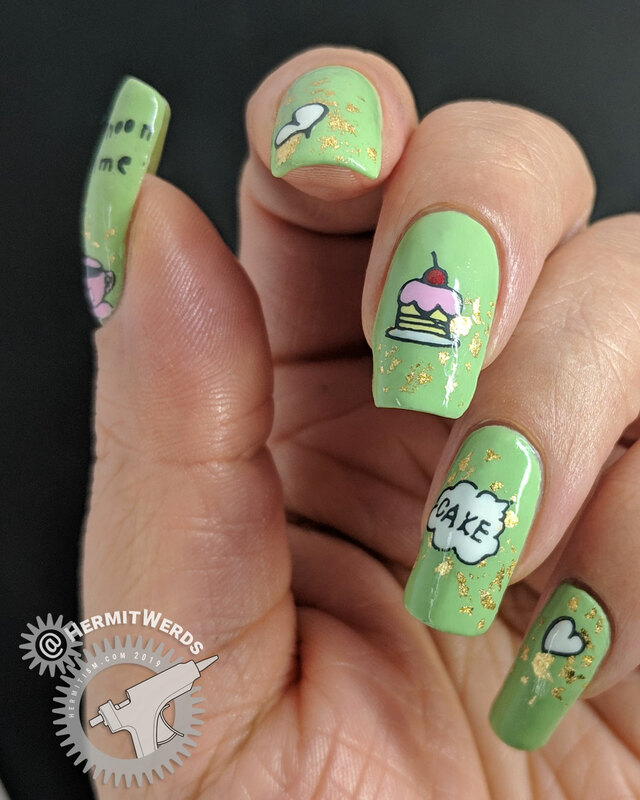 In fact, I am so into cake and apparently the word “cake” that this is the second time I used some of these stamping images. 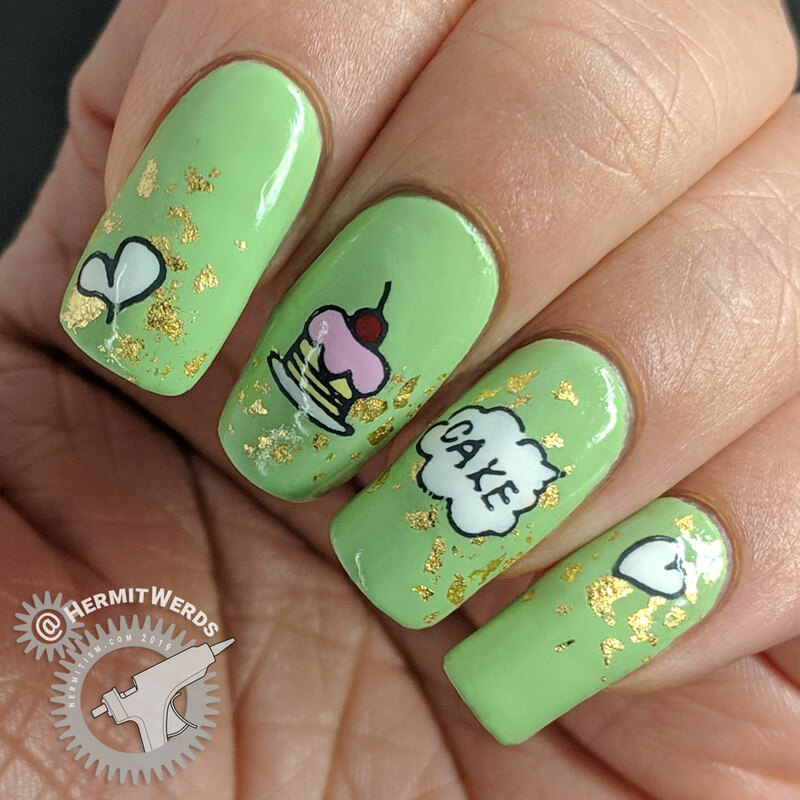 Now I’d just finished painting the Tea Party design when Cake came up and I thought to myself: these two go together. 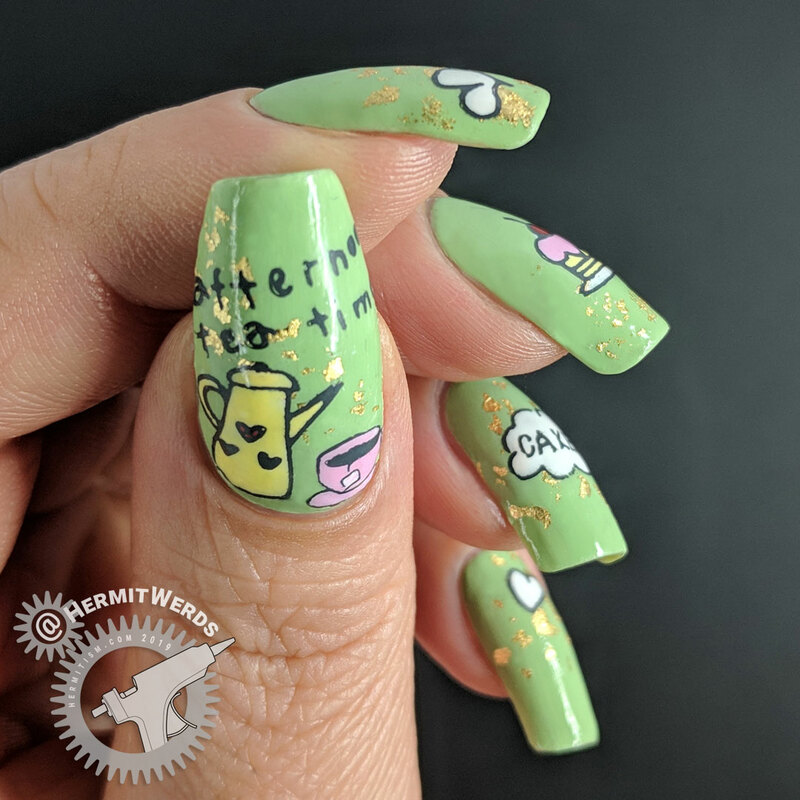 Like…can you picture having a little tea party and not including some sort of treat with it? So, really…tea party = cake. Normally when I see people using gilding foil they are accenting some beautifully abstract nail art. Not me! This felt a little far from that (haha) and I was worried that it would end up clashing stylistically. But I think it’s fair to say gilding foil works with cute too. Or maybe I’m so entranced with the thought of cake that I am missing something. Caaake. The foils worked great and I definitely want to use them more. For instance: I would like to see how well they work in an advanced stamping decal. It might also be interesting to see them in a pond mani or even combined with lead light. Thanks for hanging with me! Until next time, friends!